Located on the north side of Town Center Plaza, next to Macy’s and Things Remembered. Open daily from Nov 17th through Dec 23rd. The sessions are approximately 3-5 minutes and are by appointment, so there’s no standing in line. After your session please allow time to view and order your images. Packages are printed on site and ready to take home at check out. Appointments are per family – not per child. Each family needs to book their own separate appointment. We can accommodate family groups as long as the individual families have booked appointments in connecting time slot. Appointments are scheduled in 5 minute slots so book early to get connecting time slots. 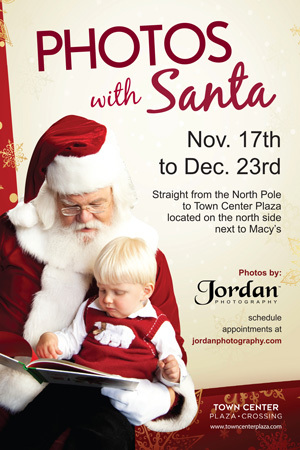 When you arrive at Photos with Santa by Jordan Photography please check in with our staff. 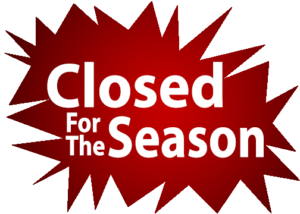 To schedule an appointment or check availability, please visit our SCHEDULE page. Then, select the appointment option that best fits your family’s needs. Choose the day and time that works best for your schedule. Finally, don’t forget to click on the CONFIRM APPOINTMENT button to finalize your appointment or it will not be booked. You can change your appointment by clicking on the link found in your confirmation email. First, cancel your current appointment and then schedule a new appointment.